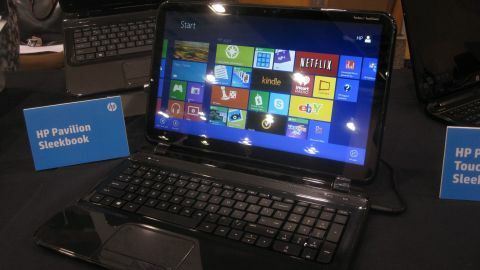 CES 2013 is where you'll find Windows 8 devices galore. So it's interesting seeing how some PC hardware manufacturers are trying to stick out from the rest of the pack. Take Hewlett-Packard and the company's HP Pavilion Touchbook Sleekbook, for example. The Pavilion Touchbook Sleekbook is actually a lot like the vanilla plain Pavilion Sleekbook, which was also present. Both devices sport an AMD A-Series APU (Advanced Processing Unit) CPU, 6GB of memory (which can upped to 8GB), and 1TB hard drive. When it comes to connecting it to cameras, smart phones, external displays, and the like, you have HDMI plus both USB 2.0 and USB 3.0 ports. HP has also loaded it with plenty of their proprietary solutions: HP TrueVision HD Webcams and HP MyRoom are designed for video calling and sharing images, HP CoolSense regulates temperature, and HP ProtectSmart keeps files safe and sound in case the Touchbook Sleekbook gets knocked around. Again, everything above is common to the regular Pavilion Sleekbook. So what's the key difference? The name should be everyone's biggest clue; the Pavilion Touchbook Sleekbook has a 15.6-inch touch capable screen, to offer an alternative method to interacting with Windows 8. Speaking of touching, the feel of the machine overall is its most distinct attribute. The machine sports a plastic body, resulting in a finish that's shiny. Very shiny. It also sparkles: instead of being solid black, it's covered with what can only be described as glitter. The Sleekbook is HP's line of low-cost laptop alternative, so one might make the guess that such a design choice was intentionally to perhaps make it appeal to the tastes of the younger set. That's only a wild guess, and as unfair such an assumption might be, many others will have the same gut reaction. Sticking with the impression that the HP Pavilion Touchbook Sleekbook was engineered for children, one might assume that it's a lightweight device, but that's simply not true; it's shockingly heavy. No specific weight numbers were handy when asked, and considering the size of the screen, perhaps some degree of weight is to be expected. But the toy-like appearance and feel simply betrays those expectations. Exacerbating the situation is the hinge. It's stiff and makes opening and closing difficult. The keyboard also felt a bit mushy. Did we mention how, again due to the finish, it collects fingerprints like nothing else? Yet there is one genuine positive of the device, and it's the trackpad. It's the same texture that adorns the speaker grill, so the end result is something that feels very nice to slide one's fingers around with (as well as very different). Just messing around with it for just a minute leaves an impression, and a hope that other laptops follow suit. Unfortunately, the aforementioned key differentiating factor is also a major disappointment. The responsiveness of the touchscreen was very accurate, but the image quality was sub-par. The colors were also noticeably washed out. The 1366 x 768 resolution, for a 15-inch laptop, feels rather dated for 2013, even if it is a budget machine. And when compared to the HP Pavilion Sleekbook, its touch capable bother is still not the best bargain either. Given all the strikes against it, the US$649.99 is somewhat hard to swallow. Though be sure to check it out for yourself, when it arrives on Febuary 3.